After a Christmas full of German chocolate, French wine and Italian coffee, the UK has now turned its attention once more to its membership within the EU, and the impending lack thereof. With yesterday’s vote, Parliament voted against the deal proposed by the Prime Minister, to govern the British exit of the European Union. The margin of defeat was wider than many expected, with the PM’s deal only finding support from roughly 31% of the Parliamentary electorate. As a result, there is to be a confidence vote later today which will determine whether the PM is able to continue in this role, or if an alternative Government is required (which will yield either a new PM/governing party, or a General Election). This development certainly does not provide clarity for the brand owner or IP practitioner, and it is looking increasingly likely that this unclear position will persist right up to the wire. This most recent step may be in the direction of a No Deal Brexit scenario, as discussed here, given that there is (at present) no deal on the table for discussion, barring that which has been expressly defeated. To add a further complication to this already tortuous position, there appears to be mounting pressure for a further referendum on remaining in the EU, in light of the prospect of leaving without a deal. The so called “People’s Vote” is gaining traction (indeed, it appears that Donald Tusk is the latest advocate), but it remains to be seen whether this movement will gain enough momentum between now and 29 March. In addition, the constitutional implications of reverting on the referendum result from 2016 are considerable, and this may prove a sufficient deterrent against such a vote. The terms of Brexit remain elusive and the UK may also now face new leadership. 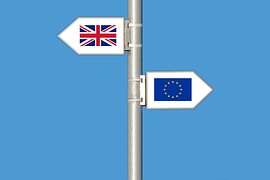 There is a reasonable argument to make that the closer we toddle towards 29 March 2019, the more likely a No Deal scenario becomes, given the apparent lack of an acceptable alternative. Based on the present position, one might be wise to consider their options in event of no deal being reached.